So I’ve concluded that since nerdgirl Lindsay (and many other people – Abby? Are you doing it this year?) is participating in NaNoWriMo (National Novel Writing Month) and attempting to write 50,000 words in the month of November, I can at least attempt to blog more often. Up first —- well, guys, I’ve been crafting again. 🙂 And you can’t tell my mom because it’s her Christmas present! Don’t worry – she doesn’t spend much time browsing the Internet and isn’t on Facebook, so I don’t expect her to stumble on this or anything. 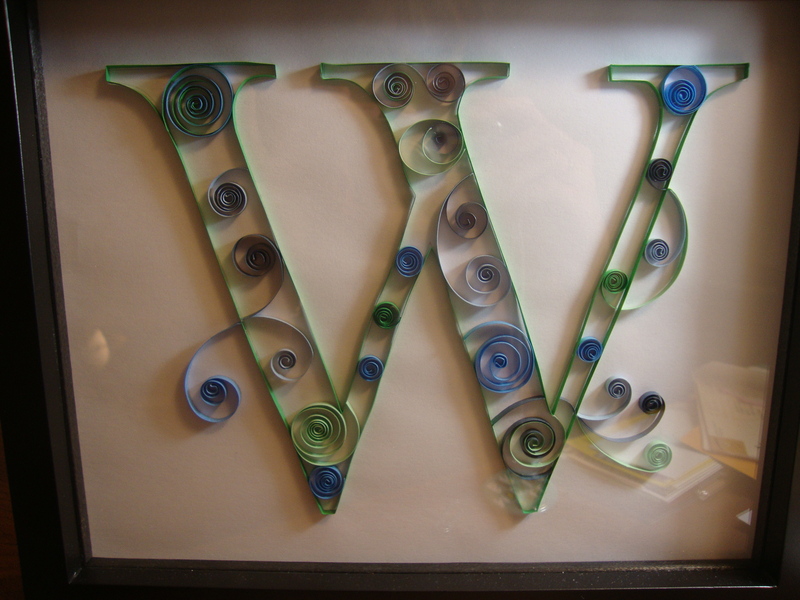 The picture’s not great, but it’s quilled. The idea came from this blog post on Craftastical, which I saw a few months ago. I am all about craft blogs now. If you read a good one, let me know! These were a gift for someone. I might need to make the chandelier-looking ones in the lower right-hand corner for myself. These are all for me. 🙂 I wear the pink & black circles one a lot. 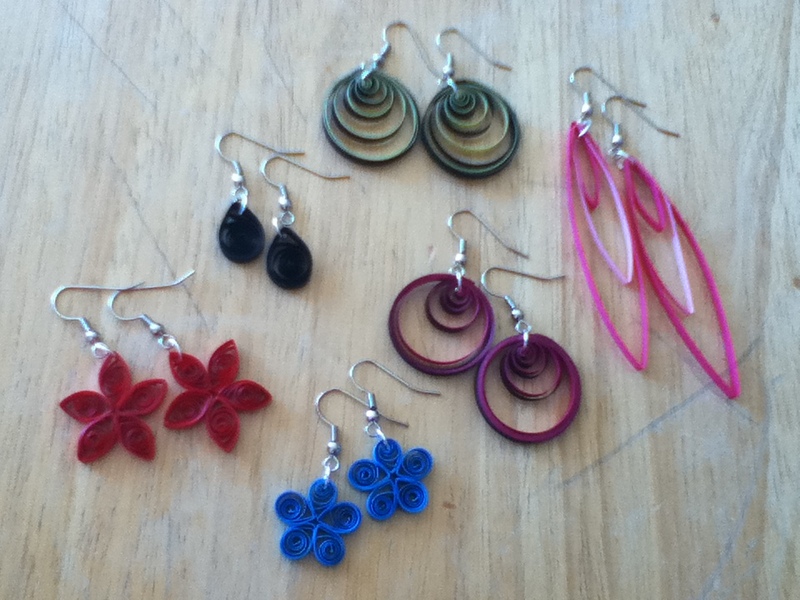 The color of the flowers don’t really match anything I own (um, duh, think through your colors before making yourself earrings! ), so I don’t wear them often. 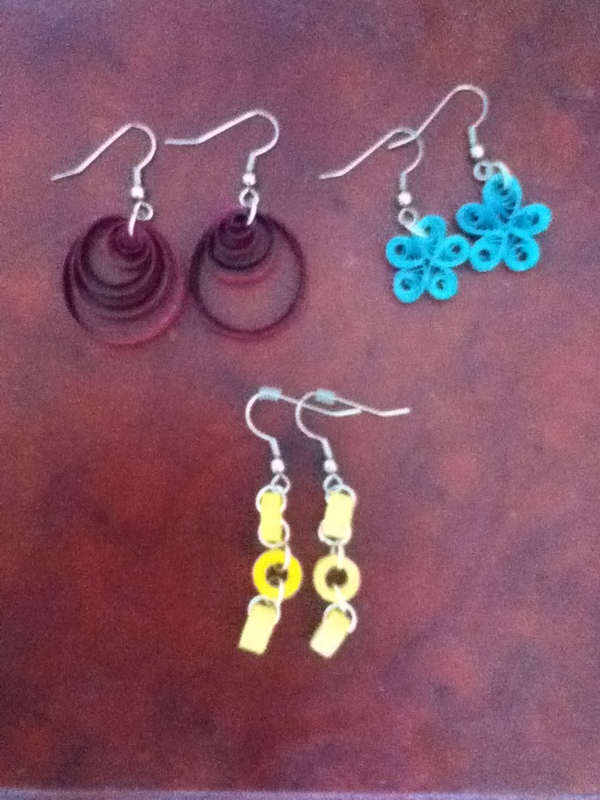 And I just made the yellow ones a few days ago, but I already love them. They look better in person. 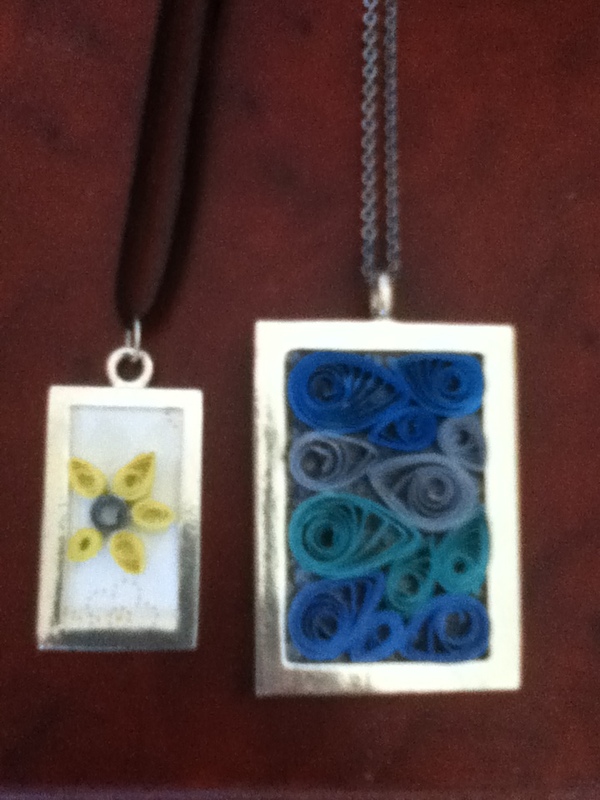 I branched out to pendants too. I got the idea for the bluish one from this blog post, but it came out my own way. Again, looks better in person. 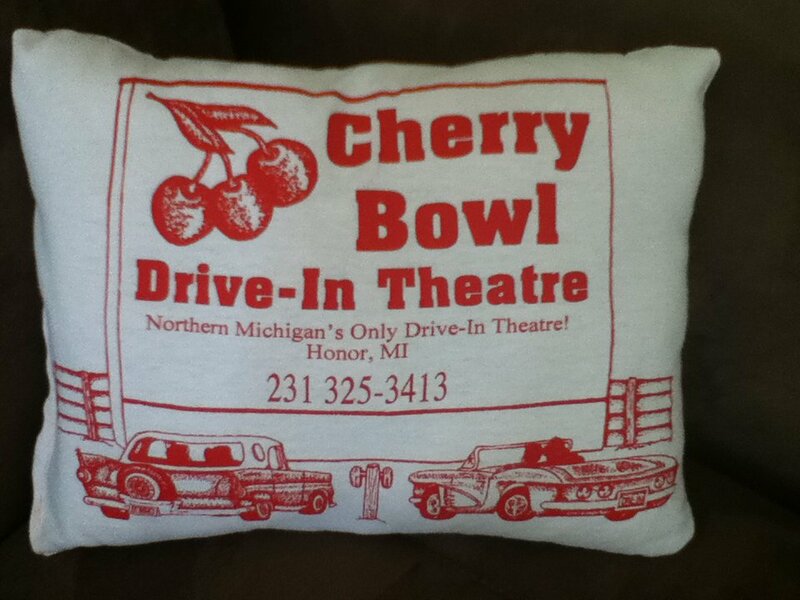 And just for fun — here’s a pillow I made Thursday from an old t-shirt! I hope you are not tired of family traditions or craft posts yet! This is one of my favorite family traditions. A few haven’t held up over the years, so I’m missing a few, but you get the gist of it. 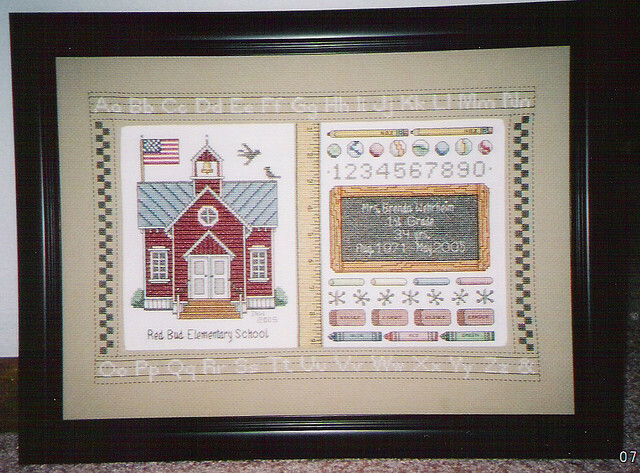 There’s a lot of knitting, cross-stitching, and lately, stamping. 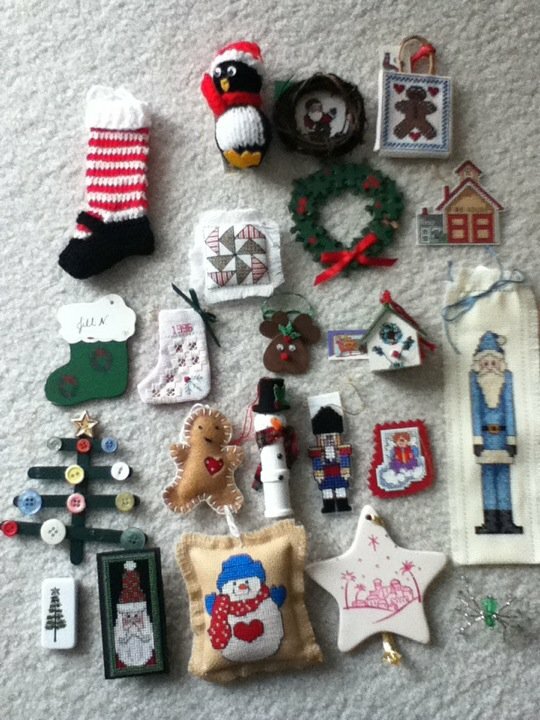 Occasionally, someone else joins in the fun of making approximately 40 ornaments, and gives my aunts a break. My uncle and aunt who made my wooden calendar made the little wooden birdhouses and a cousin made the wooden stocking cutout and stamped the dominoes (the tree in the lower corner). I helped with the long skinny Santas, which is how and when I learned to cross-stitch. It’s always a big secret about what the ornament is for the year. I felt really honored to get to know when I was helping with the skinny Santa. Whoever hosts Christmas gets to display all of the ornaments. 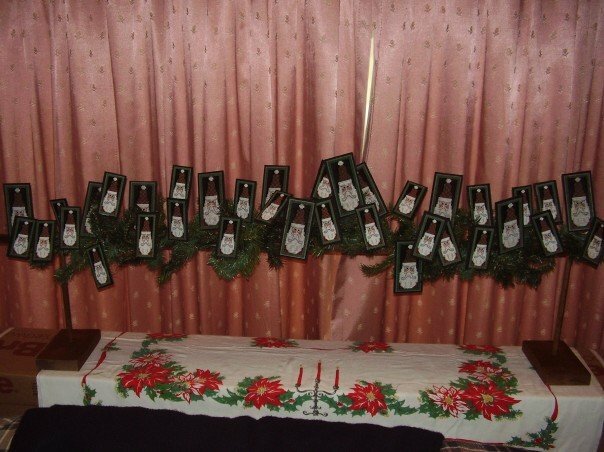 This is a pic from the year my parents hosted Christmas. This is such a fun tradition because it’s gone on for so long. I love having so many ornaments, and they have a lot of meaning. Each year my Christmas tree is basically full just from family ornaments. I love it! I have a new craft. 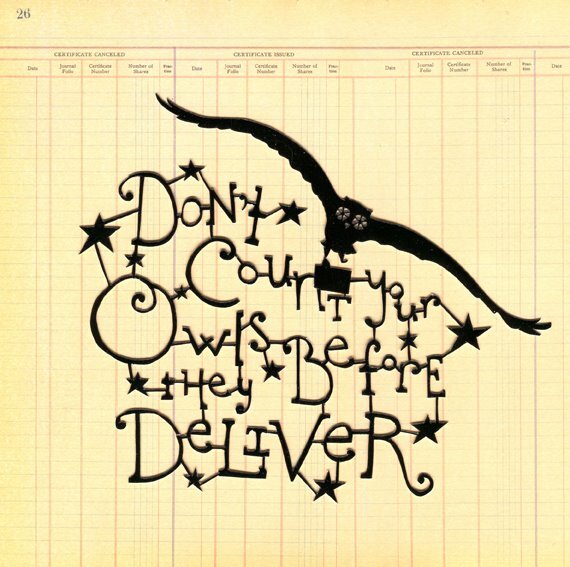 One of my coworkers taught me how to quill. I love it! Basically it’s rolling paper into shapes. Looks hard, but it’s totally not. 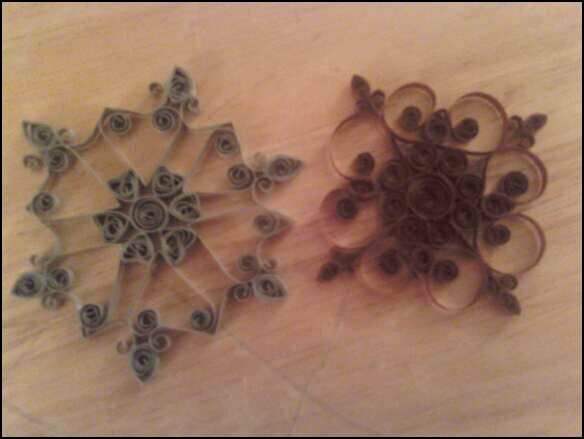 The easiest way to begin is to make snowflakes. They work very well as ornaments. Really these are just shapes (teardrop, scroll, marquis, etc.) put together. 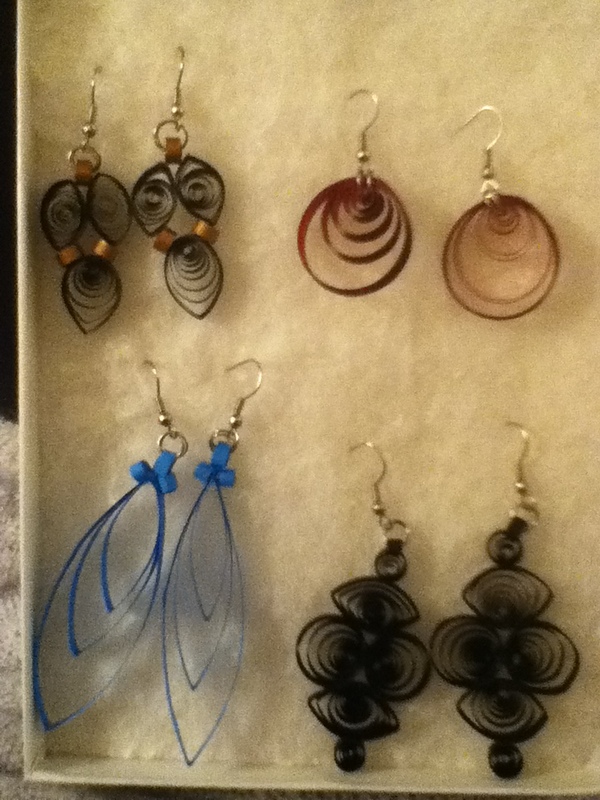 Then I moved on to making earrings. When I needed BEDA ideas, Jen suggested my family traditions because we seem to have so many. Since I had a craft program today at work, today seems very fitting to talk about my family’s craftiness. We’ve now started to move into paper crafts. Several of my aunts, cousins, my older sister and I make greeting cards, and I learned how to quill. Some of us still do more traditional crafts though. One of my aunts makes quilts out of jeans. Whenever we trade names for Christmas, everyone hopes she’ll get their name. Keep your fingers crossed for me – I totally want one. 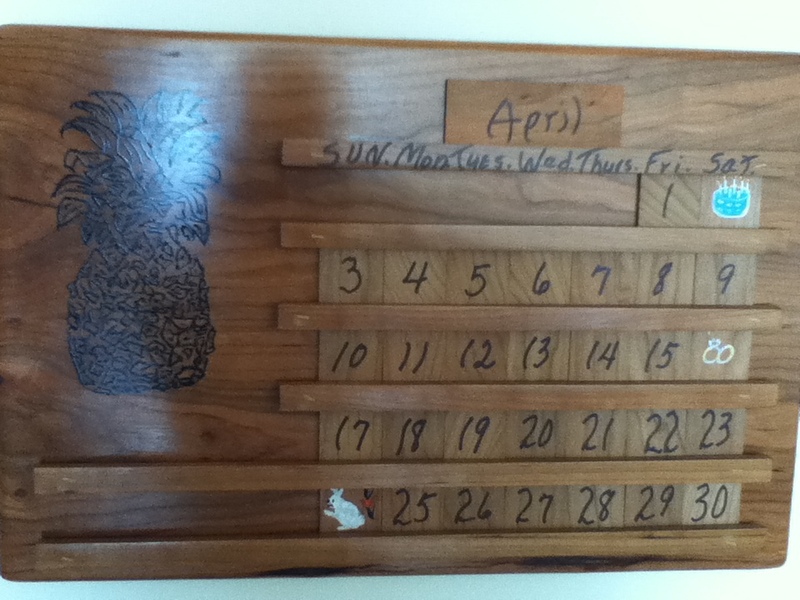 🙂 One of my uncles does a lot of woodworking, and this year for Christmas I got an awesome wooden calendar that he made and my aunt painted. Stay tuned for more family traditions! I have a craft program next month at my library, and since I’ve never done the craft, I figured it’d be a good idea to try it beforehand so I know what I’m doing. So……here’s my new tote bag! 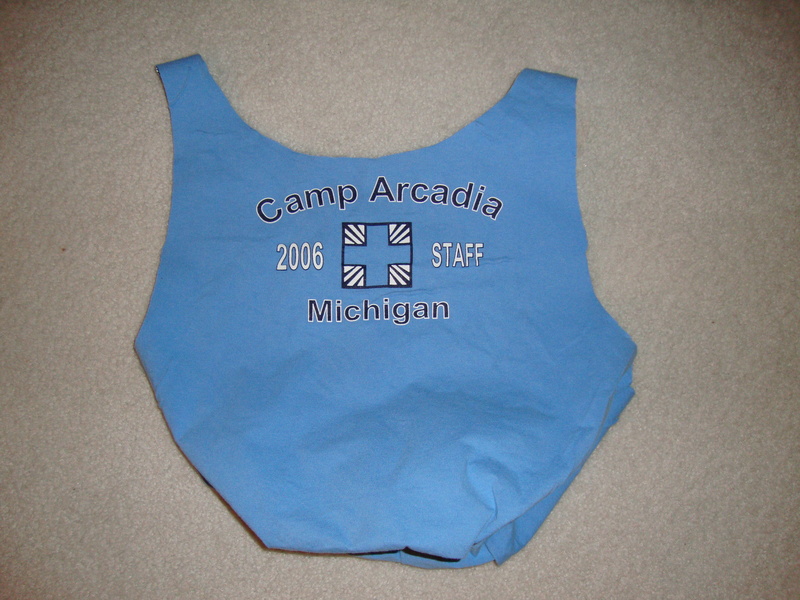 It’s made from a t-shirt! I should have taken a picture of it in t-shirt form. Oh well, you’ll just have to believe me. The design came from a book called Simply Sublime Bags. There was NO sewing involved, which is good because I don’t know how to sew. You just use staples and duct tape! The book has a ton of other great no-sew or low-sew projects. My cousin is getting married next weekend, and I found a pattern for a cute black clutch, so I decided to try that one too. I am SO proud of this! I can’t believe I made it myself. It was totally worth the HOURS of work and frustration. The design’s not especially complicated; I just couldn’t wrap my head around some of the instructions. 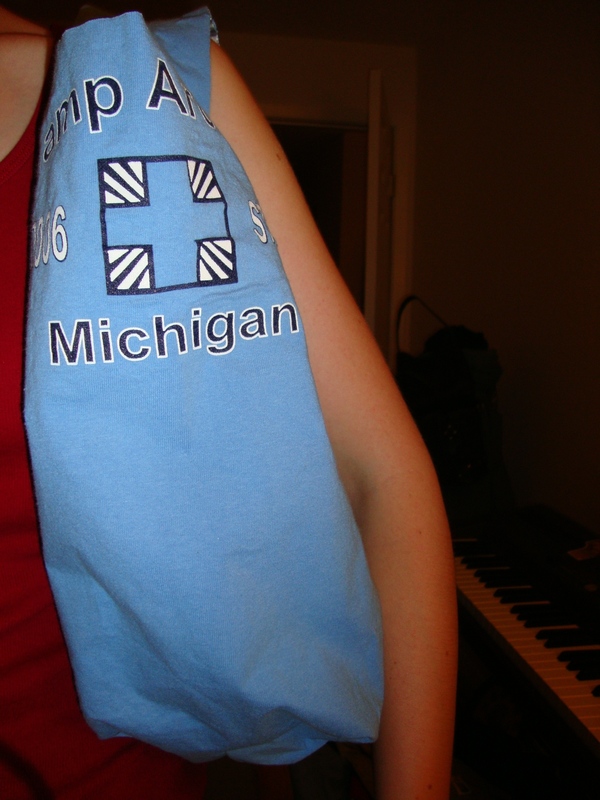 It was another no-sew project – ribbon, duct tape, and staples. 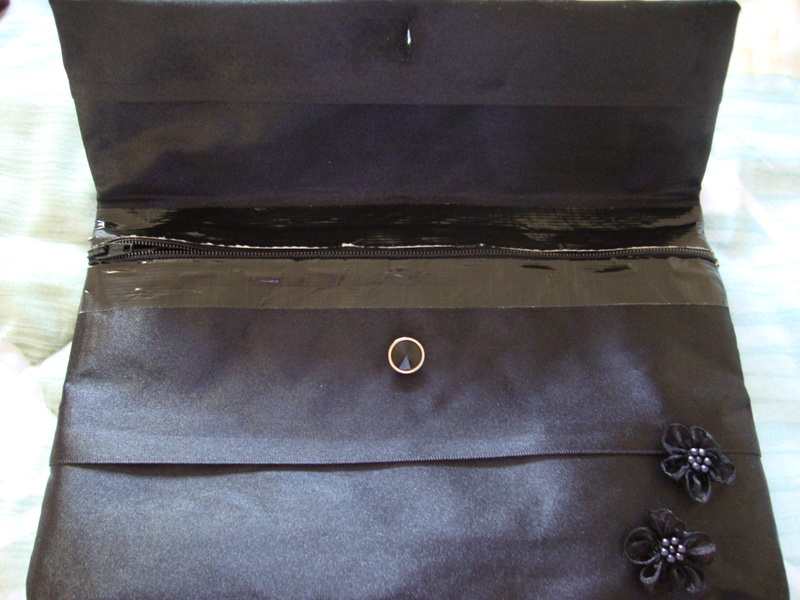 The outside is made out of 3″ black satin ribbon. 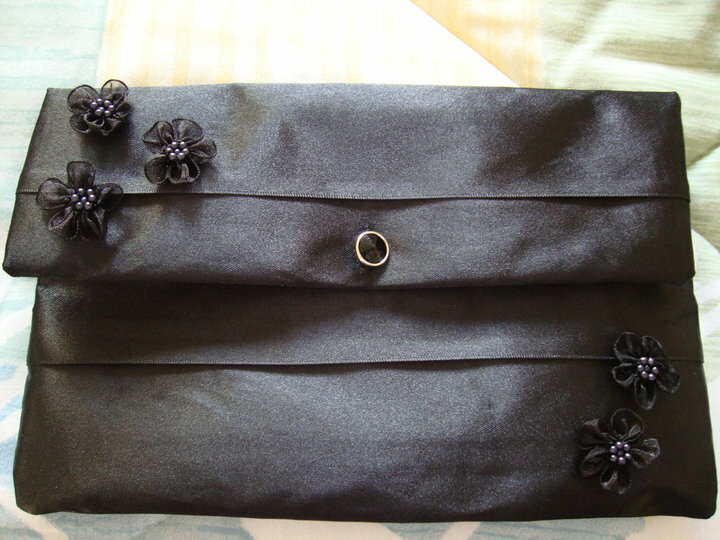 When I was done, I glued on black flowers and added a button to keep it closed. When the flap is open, you can start to see the duct tape. The inside lining is all duct tape but it’s black and aside from the shiny, you don’t really notice. Plus, who really looks inside your purse besides you? Oh, and I almost forgot – there’s a ZIPPER! You can kind of see it in the above picture. (It starts on the left.) To me, a zipper says that this is a REAL purse. 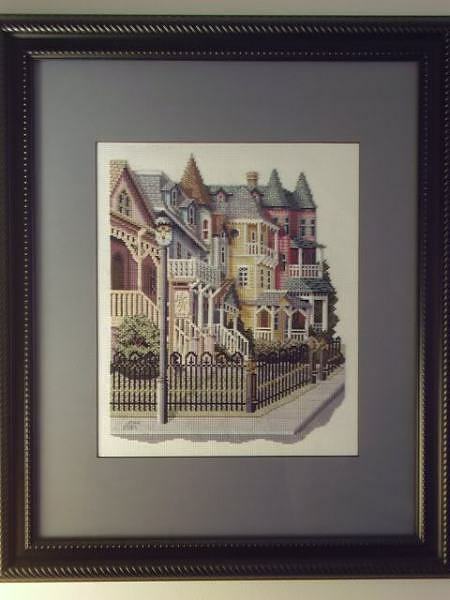 I inherited the craft gene, and I’ve done lots of crafts before – crocheting, cross-stitching, card-making – but never anything like this. So I think if I can make a purse, you could too! Scherenschnitte! My new hobby that I haven’t started yet! So I have been obsessed with wanting to learn scherenschnitte every since I saw that the German American Heritage Center was offering classes–unfortunately Librarians work Saturdays so I haven’t been able to take any of ’em. And despite ogling Cindy Ferguson’s Scherenschnitte blog and checking out numerous books from the library, I have yet to try it myself. Mark my words. One day I will be a Scherenschnitte MASTER 🙂 I already own a tiny pair of scissors!